Enjoy mini burgers—AKA garlicky meatballs! 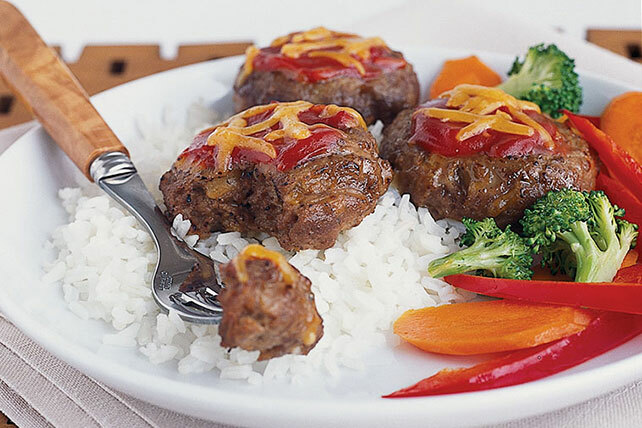 Whatever you call them, there's one thing we know: these Cheesy Mini Burgers are great on white rice or slider buns! Mix meat, 2/3 cup cheese, 1/4 cup ketchup and garlic powder; shape into 12 balls. Place, 4-inches apart, on foil-covered baking sheet sprayed with cooking spray; flatten each into 1/2-inch-thick patty. Bake 15 min. or until done (160ºF); drain. Spread patties with remaining ketchup. Top with remaining cheese; bake 5 min. or until melted. Serve over rice. Serve with steamed stir-fry vegetables. Omit rice. Serve burgers in slider buns. Substitute KRAFT or BULL'S-EYE Barbecue Sauce for the ketchup.